You are currently browsing the category archive for the ‘spiritual practices’ category. Each year for the season of Lent, since 2011, I have undertaken three spiritual practices: one subtractive, one additive, and one giving. This year, as I have done a few times before, I will subtract social media: no Facebook or Twitter. (I’m not cool enough for Instagram, so nothing to give up there.) It’s good for my soul. For the additive practice, I’m participating in #UULent’s photo-a-day practice. 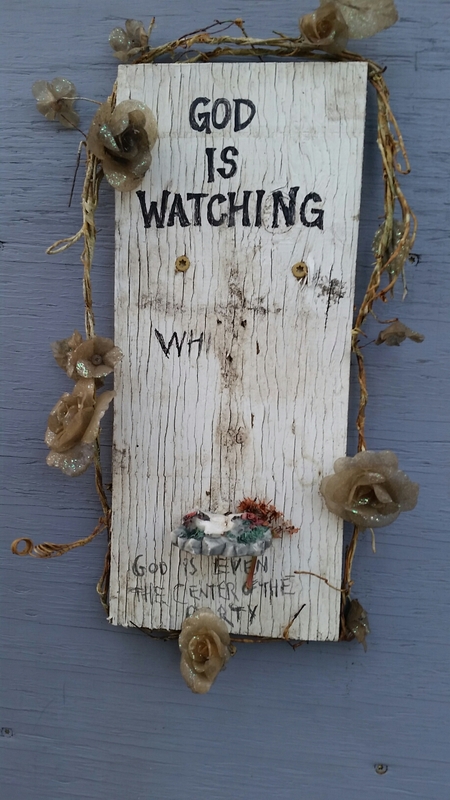 This is in direct contradiction of my subtractive practice, since I’ve proposed to my congregation that we post our photos on the congregation’s Facebook site–sharing a spiritual practice really helps it stick. However, I think it’s in the spirit of my social-media fast if I do nothing on Facebook other than post my photos and look at others’. I’m also encouraging folks to post selected photos (only their own) on the bulletin board between rooms 9 & 10 at UUCPA. When I did this (spottily) a couple of years ago, Barb Greve was someone I knew mostly by reputation and occasionally running into him at installations or ordinations, but currently, we are working together at the Unitarian Universalist Church of Palo Alto, so using a resource he created is extra special. Last year I did art every day, and I would love to do it again, but along with the daily photo it seems too much. I’ll see. And I always choose a cause to which to give money, and this year it was easy to choose: Black Lives of UU. The UUA has committed to raising $5.3 million for BLUU, and individual contributions are part of that work, so this is my mite. You can contribute yours at the BLUU website. I am excited, occasionally even hopeful, about the UUA’s renewed commitment to shift us away from the dominance of white culture and help us shake off the effects of white supremacy, and it will take thousands of us to realize this commitment. 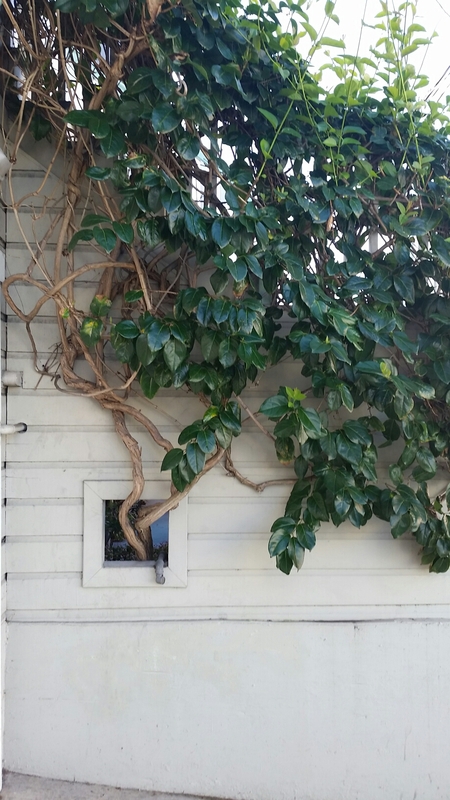 Harrison & 26th, San Francisco. 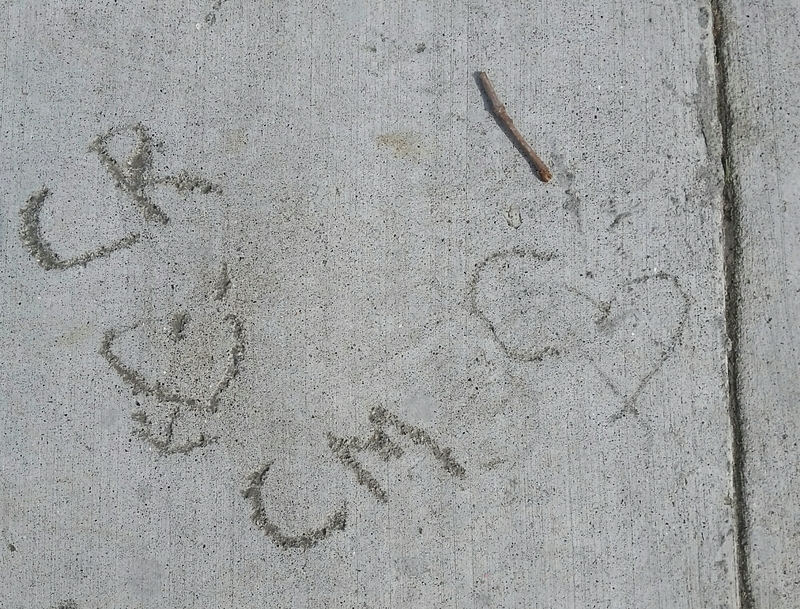 I wonder who was so moved to put the sign of their love into concrete, and how it and they are doing now. Some of these photos have been sitting in my camera, waiting to be uploaded. Others, I’ve only just taken today. Daily practices are tough for me, and I still have some gaps, but I’m benefiting from the reflection and from taking a relaxed attitude. 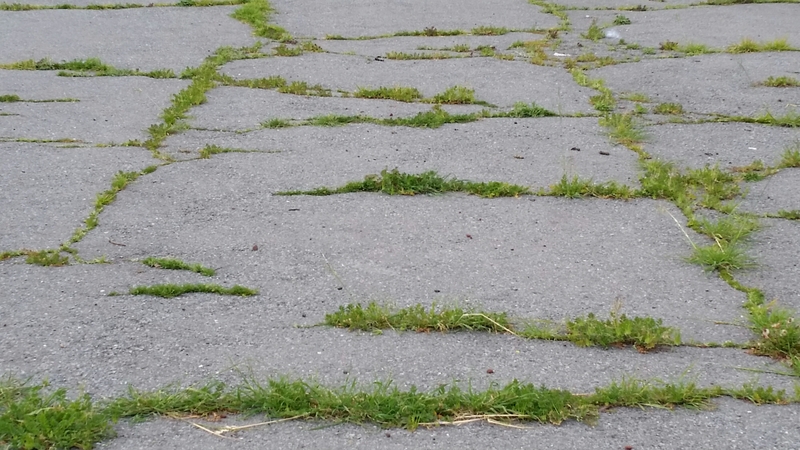 I used to fantasize about the grass and wildflowers retaking the endless acres of asphalt, the concrete breaking up from the force of tree roots. I am a little more accepting of urban ugliness, and a little more tired and resigned now. Just the same, when I see something like this, I feel like I am seeing healing in action. 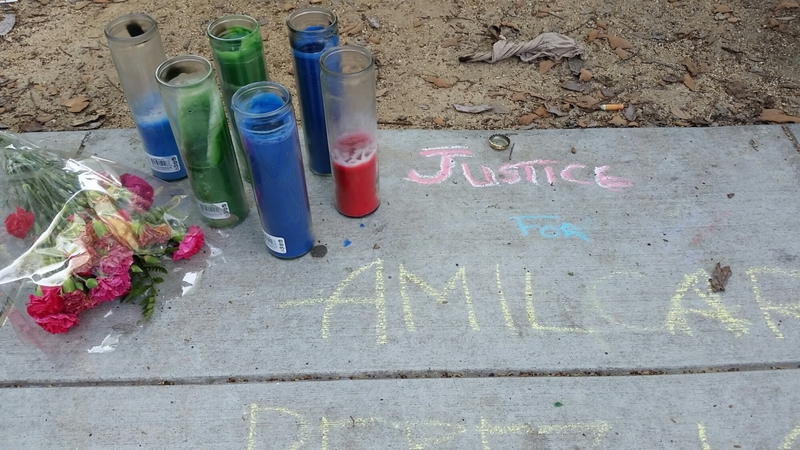 Folsom Street, San Francisco, near the place where Amilcar Perez-Lopez died at the hands of plainclothes police. A recent autopsy has shown that he was shot four times in the back, contradicting the officers’ claims that they fired as he lunged at them. No indictment has followed yet. Skipping ahead a few days to yesterday’s word, which was the 14th of this Lent practice: creativity. This evening while she practiced violin, my daughter said maybe she’d like to be a “music writer” when she grows up. I pointed out that she already is; she makes up songs all the time. She agreed, but maintained that she means professionally. We will have to introduce her to some of the composers we know, some of whom she knows already too. She asked me for that music notebook we have, and as she paused to think, I took this photo. Ah, daily practices are so hard for me! I took this a few days ago as I walked through the city thinking of some of the words for meditation. This image seemed like a metaphor for how suffering often feels: shut out from human connection, cut off from parts of oneself, trapped, fragmented.